In universities, space is usually at a premium. With the multitude of different courses available and various different activities taking place space has to be versatile and able to adapt to activities quickly and efficiently. Lecture theatres, seminar rooms and workshops – enabling events to be held simultaneously such as exams and meetings. Our newest folding wall system was recently introduced to our collection, the new stylish system is easier than ever to operate, perfect for when the layout of the room needs to be changed throughout the day, available in a range of styles with the option of graphic printing for truly unique customisation. All our systems are manufactured in-house and Building Additions will be your sole point of contact throughout product selection, manufacture, installation and aftercare – meaning no extra expense is required for 3rd party contractors. Our systems are designed to keep you compliant with the requirements set by the Department of Education and Skills. Having completed work in many Schools, Colleges and Universities over the years –choosing Building Additions for your movable wall or partition ensures peace of mind. Regular maintenance of your partition system is required by law to comply with Health and Safety obligations and failure to comply can result in fines in the event of an injury. Building Additions are on hand to help you comply with regulation by providing ongoing maintenance of your system by a qualified engineer; as well as providing you with necessary paperwork should evidence be required. Our regular maintenance contracts are a cost effective way of ensuring your wall system is compliant and working at its best. 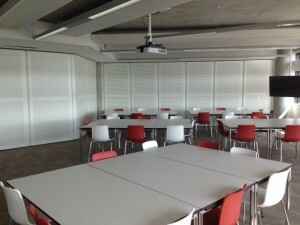 If you’re considering installing a partition system or moveable wall in your university premises, give us a call on 01373 45477 to discuss what we can offer you.